Long-term readers of The Science of Forming column and attendees at PMA metalforming seminars are acutely aware of the emphasis given to the workhardening of metals and the workhardening exponent or n-value. This exposure to n-value generates a variety of questions about its importance, measurement, source, application and other sometimes fine details. A number of these issues are reviewed this month. They provide a quick checklist to those very familiar with the n-value, and an introduction for those less active in the field. • Why is n-value so important? Excessive stretching leads to local necking and tearing of the stamping. The n-value is the one property of sheetmetal that helps the most in evaluating its relative stretchability. I have never heard this type of question asked before last month. Perhaps the person was familiar with equations such as that used to calculate carbon equivalent (CE) used to predict the relative difficulty of welding. CE = %C + (%Mn + %Si)/6 + etc. Fortunately, the n-value is not that complicated, but is a primary metal property measured directly during a tensile test. • What physically is the n-value? When metal alloys are cold worked, their yield strength increases. The n-value is the amount of strengthening for each increment of straining. 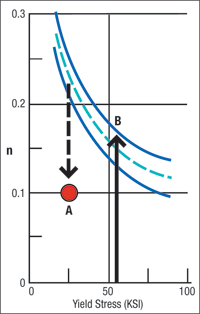 The higher the n-value, the steeper the stress-strain curve in the uniform elongation region of the tensile test. • How much additional tensile testing is required to obtain the n-value? Usually none. If the property data are acquired automatically during a tensile test and processed by computer software, most of the new property calculation codes automatically compute n-value. The n-value is measured over a strain range from 10 to 20 percent, 7 to 15 percent or 10 percent to UTS. The n-value will print with the rest of the data if the n-value switch is turned on. • Our tensile test machine does not compute the n-value. Is there some other of estimating n-value? There is a complex equation based on the tensile strength/yield strength ratio. If the exact value of n is not needed, two or more material samples can be compared using just the TS/YS ratio if none of the samples have any yield point elongation (YPE). A higher ratio means more stretchability. • Some higher strength steel specifications require a spread of 10,000 or 20,000 PSI between the yield strength and tensile strength. Is this related to the n-value? Absolutely. The greater the spread between the yield and tensile strengths, the steeper will be the stress-strain curve and the higher the n-value. Likewise, the TS/YS ratio will increase with the increased spread. This shows the steel with the 20,000 PSI spread will have more stretchability than the steel with only a 10,000 PSI spread. • We order by yield strength and only that value is reported to us from our supplier. Is there a of obtaining the n-value from only that single piece of data? For low-carbon steels that have a single microstructure of ferrite, a historical data band can be constructed (See graph). The n-value decreases with increasing yield strength. The processes used to strengthen the metal also reduce the n-value. • Sometimes a coil is received that fails in a severe stretch area, while other coils form successfully. Would this be a low n-value problem? Checking the n-value of the problem coil would be a good first step. This problem is highlighted as point A in the graph. A steel mill or service center sometimes will correct poor shape with an extra heavy temper pass. While the yield strength may increase slightly, a major reduction in the n-value will take place. Other possibilities include a different chemistry, different processing, or even shipment of the wrong coil. The die reacts to the properties of the incoming blank. It really does not care what caused the difference. • Can you explain why specifying the minimum yield strength of higher strength steels limits the maximum n-value? The graph shows why this relationship happens. The upper curve is the maximum expected n-value as a function of yield strength. The arrow B represents the minimum specified yield strength. The intersection is the maximum n-value. To obtain a higher n value, one would have to reduce the yield strength below the specification. For this reason, some of the new advanced higher strength steels have complex microstructures that allow higher n-values for the same strength. • The n-values for a coil of steel often are given to three decimal places. Is the third decimal place accurate? For years the n-values were only good to two decimal places. For the last decade, a large number of steel producers have improved their process control procedures so the n-value throughout most of the coil varies in the third decimal place. However, a fourth or fifth decimal place n-values are sometimes published. This usually indicates that the computer has been allowed to calculate a large number of decimal places that are not meaningful nor scientifically accurate. • We run n-value tests on some of our blanks, but the results are different from those provided by our steel supplier. Why is there a difference? Your test locations most likely are from blanks within the coil. Your steel supplier must run its tests from the coil ends. The mechanical properties of the coil ends may be different because they undergo different processing conditions compared to locations interior to the coil.